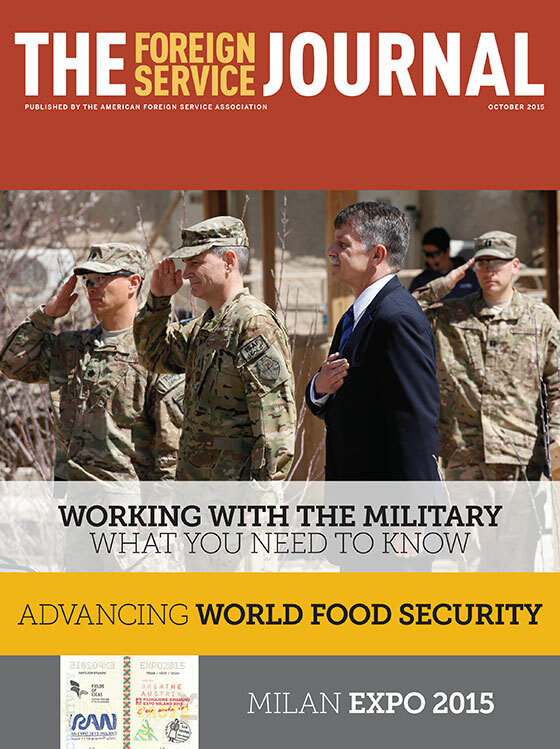 The October issue focuses on civilian-military relations. Here are some pointers for members of the Foreign Service working with the military today, from a retired senior FSO and the first political adviser to the U.S. Strategic Command. A Senior FSO describes his experience of the reality of war on assignment in southern Afghanistan. Understanding our military, its role and its importance in interagency decision-making, should be a priority for diplomats—especially those beginning their careers. In agriculture, our free trade and commodity export agendas conflict with our development agenda, and the result is food insecurity. Here is the case for a change in focus. The world’s fair has evolved from an industrial exposition into the Olympics of public diplomacy, and the United States should be there. BY LARRY W. ROEDER JR.